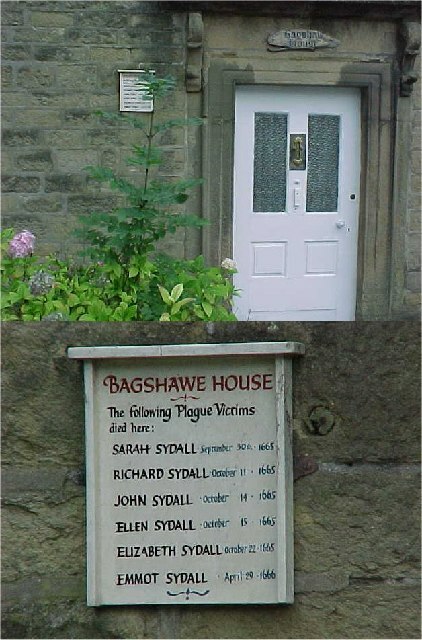 Eyam Village and the Great Plague. Eyam is a small and picturesque village in Derbyshire. If you visit, at first there is nothing to immediately distinguish it from other English villages but you’ll soon find history surrounds you. Three hundred and fifty years ago, the great plague came to the village. And the villagers decided to quarantine themselves to stop this horrible and fatal disease spreading to the rest of the north of England. The disease came to the village in 1665 when a bolt of cloth was delivered to from London to the local tailor. The cloth was infected. The cloth was set before a fire to dry and the fleas which were inside – and carrying the plague – were released. The tailor’sassistant, George Viccars, was the first person in the village to die but more followed. On the advice of the rector, William Mompesson, the villagers decided to isolate themselves so the the disease wouldn’t spread beyond the village. No-one was to leave the village and no-one was to enter. Food and other supplies were left on the outskirts of the village for pickup. The local lord, the Earl of Devonshire of Chatsworth house, donated food and supplies to the villagers. Emma, who lived in the village, was courting a young man from a neighbouring hamlet. To prevent the spread of the disease, they no longer met as they used to but would see each other from a distance. One would be on one bank of the local stream, the other on the other bank. They would call to each other and profess their mutual love. Then one day, when Roland went to the stream, his love didn’t appear. Or the next day,or the next. Emma (or Emmot to give her her correct name) had succumbed to the plague, like most of her family. Elizabeth Hancock’s story shows just how terrible this disease was. In the space of eight days, she lost her entire family; her husband and her six children. People believed that the bodies of those who had died from the disease had to be buried at once to avoid the further contamination of others. The villagers had agreed that burials should take place in isolated areas and that no funerals – where the disease could be spread – should take place. Elizabeth, singlehandedly, dragged the bodies of her loved ones to a field, dug their graves and laid them to rest. Although some modern folklorists question this, we were taught that the nursery rhyme was all know, Ring a Ring o’ Roses, was an old English song about the plague. ‘Ring’ and ‘roses’ they say, refer to a red facial rash those will the disease displayed. The ‘pocket full of posies’ is a reference to the bundles of herbs people used to carry in the hopes of warding off infection. The disease, say some, caused people to sneeze hence ‘atishoo’ and ‘we all fall down’ references their eventual fate.